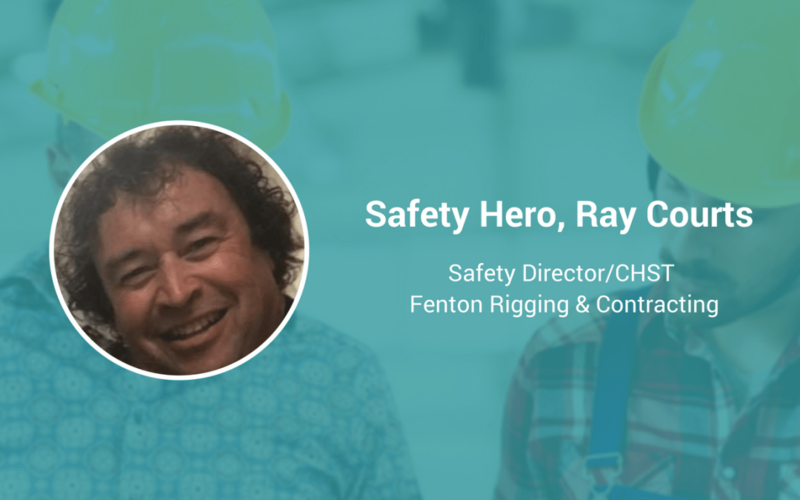 Ray Courts, Safety Director/CHST at Fenton Rigging & Contracting, is a safety leader who leads with his heart, and that’s likely part of why his people love to work for him. “Safety is as much for the employee and it is for the company,” he said when we sat down with him—which shows just a glimpse of his approach when it comes to protecting the safety and quality of life of his workers. Fenton is a fourth-generation family business. They specialize in machinery moving and installation, precision alignment, railroad bridge restoration and replacement, concrete and masonry restoration and much more. Since 1898, they have been committed to getting superior results for customers. The company can handle any job given to them, and with one of the industry’s most impressive safety records, they’ve continued to hold safety as a value throughout each generation. Keep reading to see what’s impacted Courts’ perspective on safety and why he says he has no superpower (even though we’d beg to differ). I chose my profession because I felt like I was a compassionate person. I think the safety role of most all facilities or companies needs to have a person of this nature. Being able to drive the culture of the company with the direction and help of the employees are what make it all work. I guess it just came from the heart. I knew I could make a difference! Being all in! It’s so important to understand the company rules, regulation, and direction. Then of course understanding federal regulation is also a key. Seems like the more you know the more you can give advice to everyone in the company. With all this in mind, then you have the biggest and most important job yet: listening to your crews and staff. This is key to what’s important to be effective! Listen and learn, they will give you the real information that will make you be effective and successful. I have been involved in a lot of injuries and first aid incidents. It all gets real and changes you, when you are sitting at the hospital with the spouse or a loved one of someone who is hurt. Listening to the phone calls and things that have to be done to make families continue balanced is reality. It is true that when you are hurt or injured your family is also. Safety is as much for the employee and it is for the company. Every injury and incident effects every person within the company. I realize it is bad morale for the employee and family, it also has an effect on the employee that works beside the injured worker. Another reason to get involved in safety is that it is the driving force of future work. Companies hire [other] companies with a good safety record. No company wants to be injuring employees or hire companies that are [doing something that could result in injured employees]. I think not having one is my superpower. I don’t really want to be over the top on any one thing. I can tell you my weakness: CHEESECAKE! If there was one thing that you could change about how safety is managed what would it be? I would like to go back 30 years and know what I know now about safety and culture. Then I would have a superpower. Where do you think the future of safety is headed? I think the push for safety professionals is going to be on the rise. It looks like it will always change to use technology upgrades and new resources. I think it will always move toward less line of fire work and correct people placement/positioning on the job also.